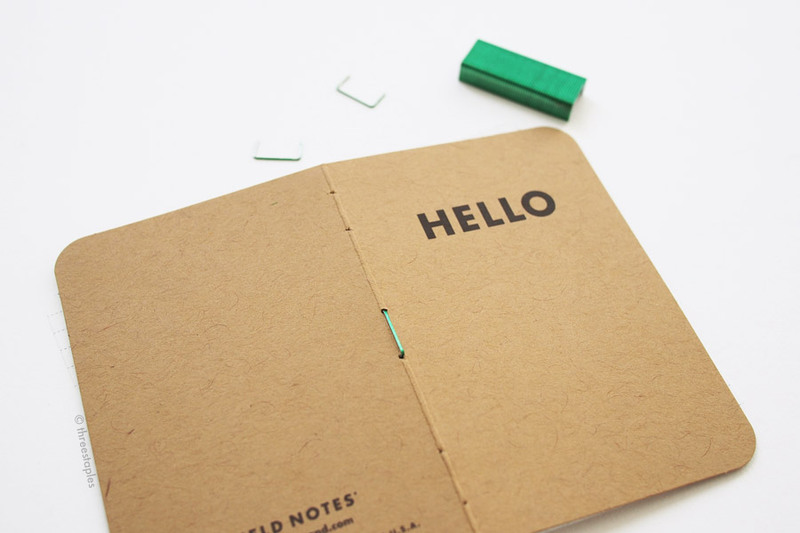 I made a couple mini memo books with the little kraft “Hello” notes that are often included in Field Notes products. Complete with graph grid innards! In case you haven’t seen them, the HELLO cards are 3" x 4" card stocks folded in half, with words of thanks from Field Notes (“FN-25 Sincere Pronouncement”) printed on the inside and a link to their mailing list sign-up page. I’ve seen them tucked into several kinds of Field Notes products, e.g. 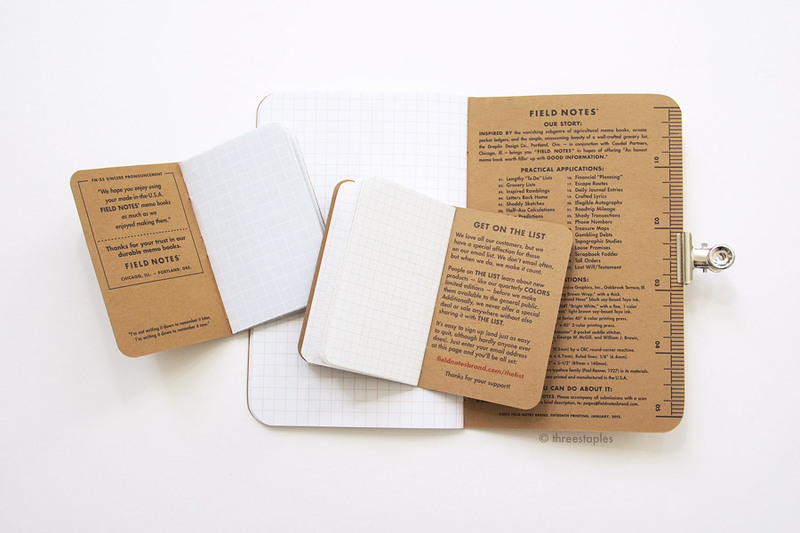 seasonal editions of Field Notes, 56-week Planners, Work Station Calendars, etc. 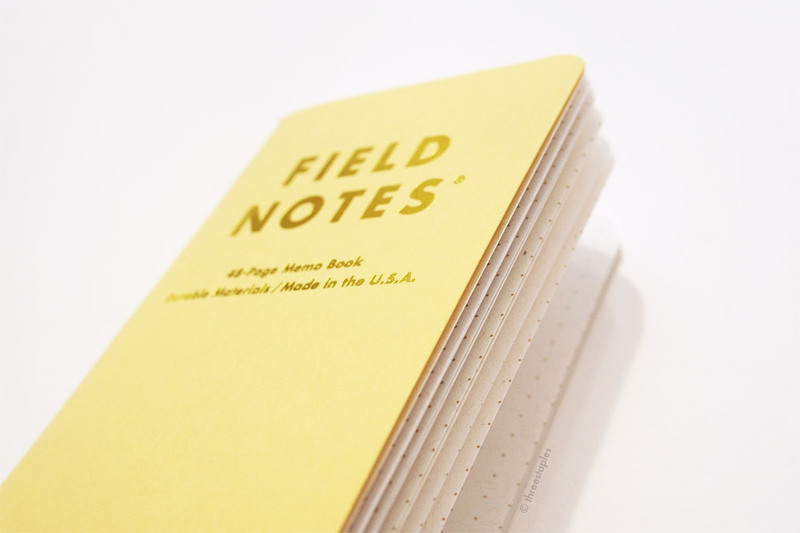 They’re obviously designed to look like the mini version of the original kraft Field Notes memo books, with rounded corners and all, so I instantly thought of making body paper (“innards”) for them when I first saw them. It took me a while to follow-through but I’m quite happy with how these turned out. As you can probably guess, the idea is straight forward. Cut some paper into 3" x 4" innards, round the corners, fold them, and then assemble them with the HELLO note as the cover, by stapling them together. But much like my previous Field Notes DIY project with colored staples, this project turned out to be a little trickier than I anticipated. If you’re interested in making your own, here’s how I made them and what I learned along the way. As mentioned, the HELLO card is 3" tall and 4" wide when opened (or 7.6 cm x 10.1 cm). But the innards need to be slightly narrower if you want to prevent them from sticking out on the side when folded (from the bulk of the paper). I ended up trimming them to about 7.5 cm x 9.8 cm but the appropriate dimension would really depend on the type and the amount of paper you want to insert. You’ll trim the width more than the height. The regular Field Notes are rounded to a 3/8" radius (9.5 mm) but the HELLO cards are rounded to a smaller radius (I don’t know the exact size). The corner rounder at my disposal, while not an exact fit, does cut to a smaller radius than the regular FNs, so I just made do with it. If your corner rounder isn’t the right size, or you don’t have one, I would guess laying the Hello card flat on the paper, and then tracing and cutting the corners manually with a pair of scissors would work just as well. It’d just be a lot more tedious and time-consuming. The staples I used are the “mini” size, no. 10 staples. I only had colored ones, so that’s what you see in the pictures. I could have used the “regular” staples but they looked disproportionately big, and 3 staples would’ve been an overkill. For obvious reasons, I wanted to add 3 staples, not 2! My mini stapler doesn’t reach deep enough, even for this mini book, so I marked some measurements on the spine with a pencil, poked holes into the stack of paper with a push pin, and manually inserted the staples one by one. A dubious skill I acquired from my previous FN project. Hope you enjoyed my little project. Funny that after working on it for awhile, the regular Field Notes felt strangely over-sized and unfamiliar, even though I’ve been using that same size every day. Also, it was a nice opportunity to appreciate Field Notes all over again because even though it’s simply constructed, I learned that there are still a lot of details that need to be just right for it to work well. Sure, Field Notes are assembled and cut mostly by machines in a different way, but it was still a learning experience. 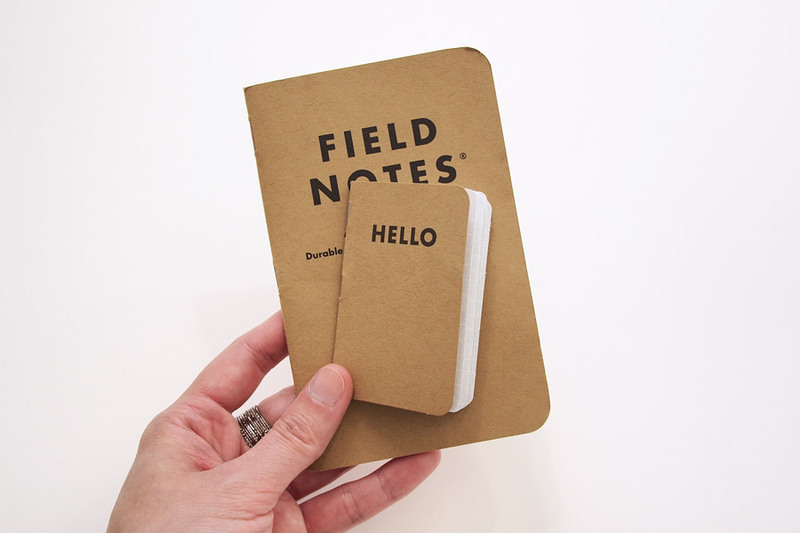 Oh, and have you seen this mini Field Notes? This little project has been on my to-do list for far too long, but I finally did it! How do you like some Field Notes with red staples? Or Sweet Tooth with, say, dot grid innards? Since Field Notes memo books are essentially just paper and three staples, you can disassemble them easily and change things up as you like. Here I’ll show you what I did and share some things I learned along the way. 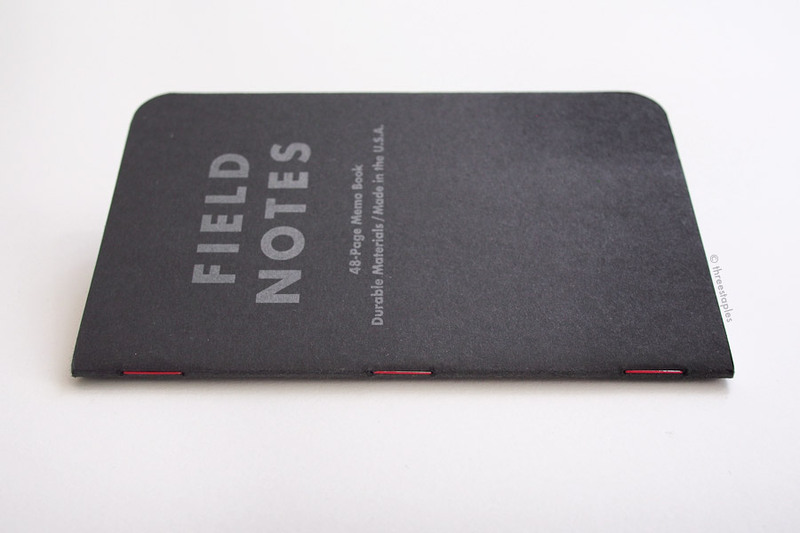 Can’t wait for Field Notes to make a red staples or green staples edition? Need to replace rusty staples? I wanted to see a red staples version, so I took out the original silver staples in a couple Field Notes, and added red staples I bought from Target. I’m particularly happy with how the Pitch Black turned out. Switching out the staples sounds easy, and it IS a simple concept, but the execution turned out to be a bit fussier than I anticipated. First, removing the original staples. I used a corner of my stainless steel ruler to pry the them open, from the inside, while being careful not to scratch the paper with the sharp corner. Much better than using my fingernails. I’ve tried using a stapler remover from the cover side but I didn’t like that it scratched/dented the paper. Anything that’s small, pointy, and strong enough to lift one of the staples legs should do, like the end of a fork. Nothing too sharp that can damage the paper, or your fingers! And try to keep the now liberated sheets of paper neatly stacked! Next, I loaded my stapler with some red staples, positioned the stack of paper as neatly as I can, and stapled away. The stapler should be long enough to reach at least 3.5" deep (the width of a Field Notes memo book). My stapler pictured above is designed for booklet binding, but it put more pressure on the spine than how the original staples were applied and flattened it a bit much. I think this stapler folds the staple legs tighter than how the Field Notes staples usually get folded. Of course, there are bound to be differences since Field Notes are saddle-stitched and I’m using a home-office stapler. There’s a lot more to staples and staplers than you think! Aligning the new staples with the holes left by the original staples was a bit tricky, too. You can see in some pictures that I missed the target and created new holes or stapled off the spine. Messy. So with Pitch Black, I channeled my inner stapler, and put the red staples in with my own hands. In other words, I snapped off one staple from the staples strip, inserted it through the original staple holes in the cover and the innards, and then folded the legs in manually and as neatly as I could. Tedious, I know. But this produced a far cleaner result. And it doesn’t require any special stapler. If I want to do this again in a pinch though, I’ll just have to use the long stapler to save time. Side note time. These “standard”-sized red staples from Target are just silver staples painted with a very thin layer of paint that tends to flake off. The undersides are not even painted either. Boo~! Sadly, this seems to be the case with a lot of consumer-grade colored staples out there (see other examples here and here). The non-silver staples found in Field Notes are higher quality, in my opinion (and have longer legs). They look like they’re silver staples coated in a thicker film of a different material. So, if I were you, I’d save the original staples, in case you want to revert the change or use them in another Field Notes, because it’d be hard to find similar ones that don’t flake off. Also, I learned that I could’ve made my own colored staples by coloring regular staples with Sharpie markers. Heh. Why stop there? 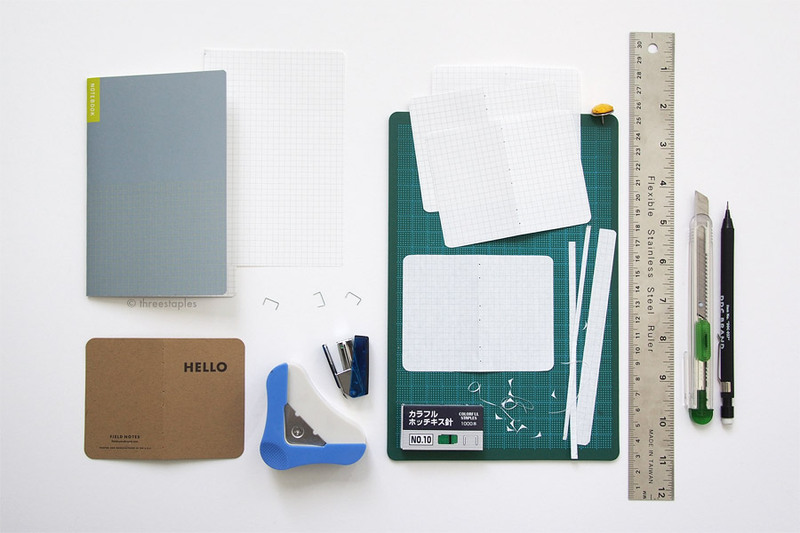 While disassembling the Field Notes, why not swap out the innards or covers too? Pictured below is a “remixed” Field Notes, with cover from Sweet Tooth and the innards from Workshop Companion (with black staples from Sweet Tooth). Yellow innards in Sweet Tooth isn’t too practical for me, and I don’t particularly love the Workshop Companion cover. So, naturally this happened. The thing to watch out for a customization like this is that it’s best to combine parts from Field Notes with staples that are about the same length and stapled at roughly the same positions. If you’ve ever taken a closer look at Field Notes staples (please tell me you have), you’ll see that the distance between the staples can be slightly different from one notebook to another. Sometimes the staples are not the same length, e.g. the gold staples in Cherry Graph are visibly shorter than the gold staples in my Drink Local. Some Field Notes are taller than others. All this might depend on the edition, time of the printing, the printing company, etc. Of course, it wouldn’t matter if you use a stapler directly and don’t mind making new holes. Just make sure to keep the stack of innards neat, center it with the cover, and staple away! I went the manual route and got lucky with this Sweet Tooth + Workshop Companion combo. The black staples in Sweet Tooth are ever so slightly shorter than the ones in Workshop Companion but it turned out okay. 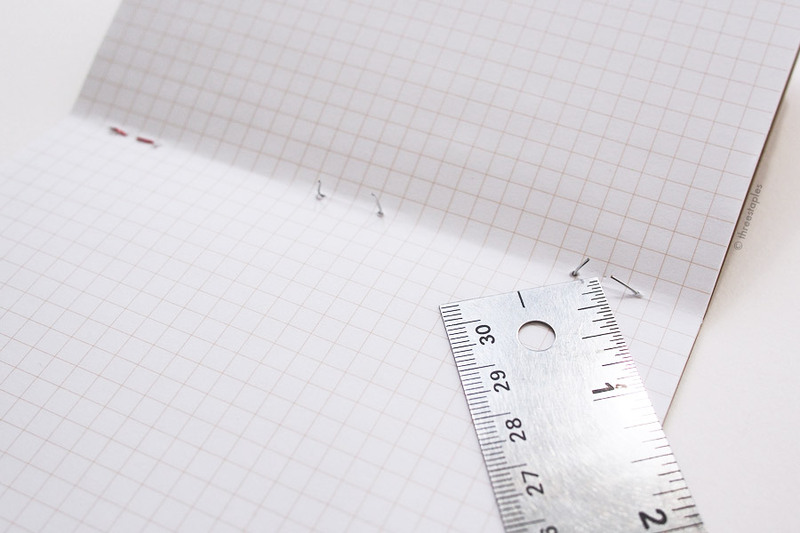 Have you ever tried replacing the staples in Field Notes with your own? Or swapped the innards or covers? Speaking of colored staples, check out these amazing Star Wars portraits made with thousands and thousands of colored staples, by artist James Haggerty.